Thanks to a Getty Campus Heritage Project grant, Haverford renews its architecture. Haverford College announced today that it will be opening an exhibit on the architectural history of the College. 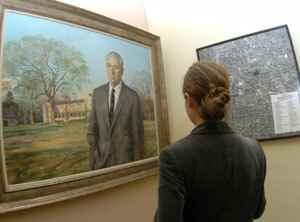 The exhibit will run from April 15th through October 7, 2005, in Haverford College's Magill Library. The three-year Getty Campus Heritage Project was funded by a $170,000 grant from the Getty Foundation. Haverford College is the oldest institution of higher education with Quaker roots, and has what many consider to be the largest array of Quaker architecture in the United States, including Haverford's administration building, Founders Hall, which was built in 1833, and is considered one of the finest examples of Quaker academic architecture. The Getty grant enabled Haverford to hire a team of architectural historians and preservationists to perform an extensive survey of the architectural and landscape history of the College, and to restore some of Haverford's principal buildings to their historic colors. "Haverford's Getty Campus Heritage Project has provided the College with significant data on the historical finishes of the buildings examined, and enables Haverford to restore the original appearance of buildings that are historically unique and represent important historic landscapes," says John Diaz, Associate Director of Facilities Management at Haverford College. "The project also provides guideposts for future campus construction." * Farm village school (1835-1855), with an old order Quaker landscape, designed to keep students within the orbit of Quaker values which had become largely rural and separate from the changing urban environment. Most buildings were sand-colored. * Victorian college campus (1860s-1890s), marked by a Quaker reconnection to the larger world, and hiring architects of different faiths and bringing new historical styles and orders to campus. Brightly hued and contrasting buildings. * Turn of the century (1895-1954), new colonial identity, with national architects working on campus in largely unified style of colonial revival stone and wood trim with unified color. * Modern Haverford College (1954-2004), modern but controlled within the campus scheme with unified color scheme throughout campus. "The survey reveals how much the choice of building and landscape design, materials and paint reflects the way an institution perceives and portrays itself internally and externally," says Haverford President Thomas Tritton. "The image and experience of a college campus sends many cultural cues as to the personality and identity of the institution. The changing design of Haverford's campus reflects the historical push and pull between its view of itself as a place that provides a safe haven for its community, and one that sees itself as an engaged participant in the events of the world. This research provides a critical thread in the evolving planning discussion that will help shape the future of Haverford College." Historic preservation consultants involved in the project include Chris Frey of Noble Preservation Services, who did the technical analysis for the project, and George Thomas and Susan Nigra Snyder of CivicVisions LP, who worked with Diana Peterson, Haverford's Special Collections Archivist, to develop the large-scale narrative panels. Since 2002 the Getty has given more than $7 million to nearly 50 colleges and universities across the nation to preserve historic buildings, sites, and landscapes.